On Wednesday night, Columbia came into Rupp and dared to tug on Superman's cape. Guess what, the Lions confirmed what we all knew but were unwilling to speak for 9 games. These Cats are human despite the record that suggests superhuman capabilities. The humanity of this team manifested in an emotionless game performance that suggested the players believed the press clippings and only needed to put on their cape and the opposition would shrink at the mere sight of superman. Columbia did not shrink from the challenge. After the initial tug on the cape, they pulled the cape off and scored the game's first 11 points. The Cats did not score for over 5 minutes. However, the inept offense was not the revealing sign of humanness because we have seen this team struggle with its offensive tools. The completely inept defense, the inability to force little Columbia to play at a tempo of the Cats' preference, the slow reaction to the missed shots, and allowing a team that probably will not play in the NCAA tournament to keep the Cats from a lead on the scoreboard for well over ½ of the entire game. The mighty Wildcats played a game that had only 51 total possessions. 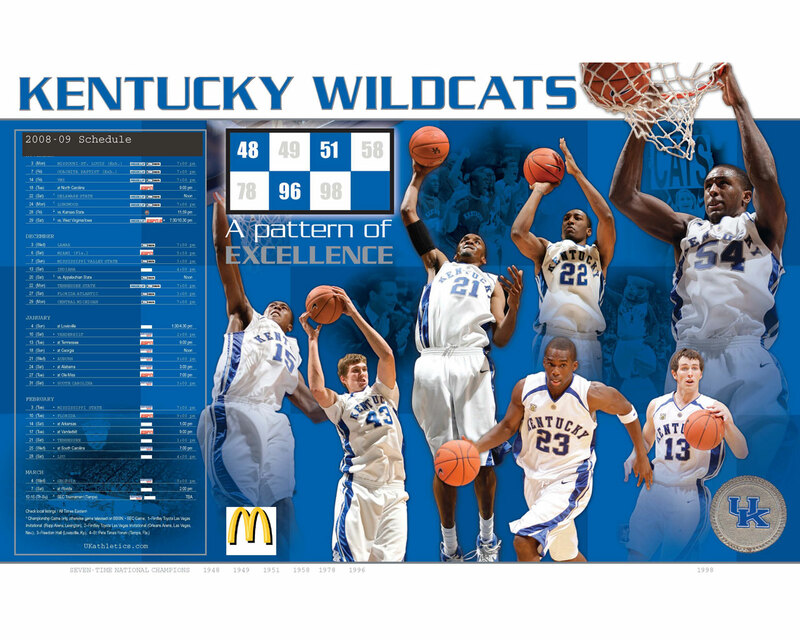 The mighty Wildcats played a game in which they spent probably 30 minutes of the 40 minute game playing defense. 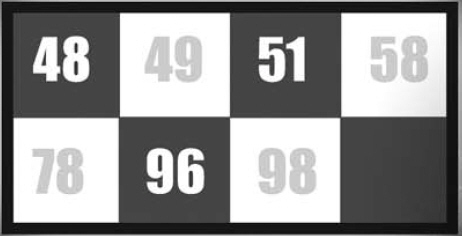 Each of these point to a formula to defeat Superman. Playing a controlled tempo game is not the style that Roy Williams' North Carolina teams like. Actually, North Carolina seems to play at one of the fastest tempos in college basketball each year. However, if Roy Williams is intent upon a chance to leave Rupp Arena this season with a rare win, he will take a serious look at the Columbia blueprint. The Tar Heels will enter Rupp Arena with a 6-2 record. To date, North Carolina's most impressive win has been by 11 over #16 Florida and by 22 over #39 UCLA, both future UK opponents. While UNC has two losses in their first eight games, neither loss can be regarded as shocking: an eight point loss to #27 Butler and a 5 point loss to #18 Iowa. North Carolina has played its first seven games at a pace of 73 to 74 possessions per game while scoring 81.4 ppg (1.104 ppp) and allowing 63.6 ppg (0.871 ppp) against an early season schedule strength of 0.6409 (#48). The Tar Heels turn the ball over on 16.6% of their possessions and force turnovers 21.1% of the time. NORTH CAROLINA retrieves 43.0% of their missed shots and 65.8% of their opponents' missed shots. The Tar Heels' adjusted NGE as of this morning is 0.280 ppp. The Cats will bring their #1 Pomeroy rating through ten games with an adjusted NGE of 0.408 ppp. This team is playing at an average pace of 66 possessions per game, scoring 75.4 ppg (1.134ppp) and allowing 45.8 ppg (0.700 ppp). The Cats turn the ball over on 16.2% of their possessions and force turnovers on 26.0% of opponent possessions. The Cats are grabbing an unheard of 46.3% of their own missed shots, and 68.9% of opponent misses. Vegas has not opened for this game as of this writing, and Pomeroy sees this game as a 12-point UK advantage, 74-62. 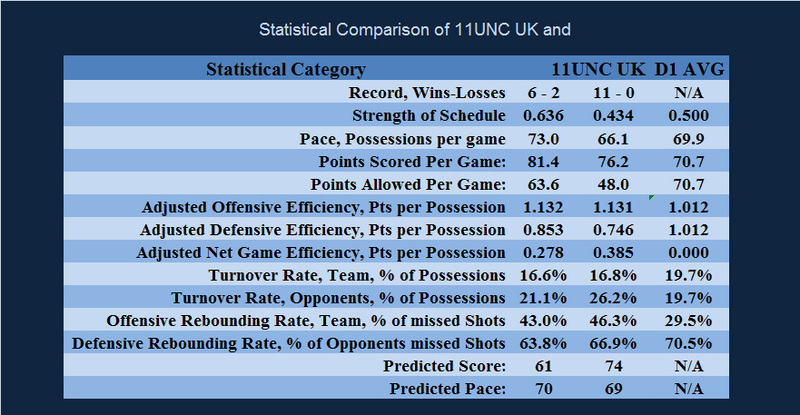 The Adjusted NGE comparison places this as a 15 point UK advantage, 74-59 in a game played at a pace of 70 possessions for North Carolina and 69 possessions for the Cats, with a game NGE of 0.23 ppp. The March towards March in Search of Perfection will continue Saturday afternoon in Rupp Arena. Subsequent to writing the analysis, the UK team sustained a serious personnel loss when Alex Poythress tore his ACL in practice on Thursday evening. The Big Blue Nation awoke to this news on Friday morning. Alex is out for the remainder of the season, and will face a post operative recovery process that will likely require 9 months, if not longer. His loss will cost this team experience and leadership on the floor. Alex Poythress was the team's best free throw shooter through 10 games this season. He will also be missed for his contribution on the Boards, where 40% of his rebounds were offensive. Over the last 30 hours, speculation has been rampant about how Coach Calipari will adjust his lineup. Will he stay with the platoon system, and if he does, will Derek Willis or Trey Lyles move into the Alex Poythress position on the first platoon? Will Coach Calipari use this event as an excuse to move away from the platoon system to a more conventional 8 player primary game rotation. How will the players respond to the loss of their teammate, and in the case of Willie Cauley-Stein, his 3 season roommate. Coach Calipari must alter his starting lineup today for the first time for a reason other than a player illness that he knows will pass with time. The platoon system has thrived through five games, with all ten games ending with double digit victories, and the average margin of victory has been 29.6 ppg. These game results had the national chatter debating whether this UK team is the best defensive team in the modern era of college basketball. Now, it is a new paradigm for the Cats. If he moves from a platoon substitution pattern today, does that signal a permanent move away from platoon substitution, or does it indicate a short-term adjustment driven by the opponent of the day, North Carolina? “If it “ain't” broke, don't fix it” has been the theme regarding the commitment to the platoons, and it is not the platoon system that is suddenly broken. What has been broken has been the health of individual players, first Alex Poythress, then Tyler Ulis and most recently Devin Booker. Now, what is broken is not temporal, but permanent, and it is Alex Poythress' knee. The starting players for the North Carolina game are Willie Cauley-Stein, Karl-Anthony Towns, Trey Lyles, Aaron Harrison, and Andrew Harrison. Platoon 2 consists of Dakari Johnson, Marcus Lee, Devin Booker, and Tyler Ulis, Coach Calipari has said he will leave one player from the starting 5 in the game rather than insert Derek Willis into the platoon rotation. That leave Derek Willis, Dominique Hawkins and E. J. Floreal will provide deep reserve help should the game require Coach Calipari to do to his 10 th , 11 th or 12 th players. The Cats control the tip and score on their first trip with a put back by Willie Cauley-Stein following a missed 3 pointer by Aaron Harrison. UNC answered with a run out on the UK make to tie the score at 2. The teams traded baskets to 4-4 before the Cats score 4 straight, but UNC stopped the mini-run with a basket to pull to within 2, 6-4. Coach Calipari brought in the second platoon, leaving Trey Lyles in the game. The second unit expanded the lead to 8 points at the under 16 media timeout around 3 pointers by Tyler Ulis and Devin Booker, and a layup by Marcus Lee. At the under 16 media timeout, the score is 16-8 with 14:53 to play and the Cats in possession folloiwng UNC's 4 th turnover. The Cats open the second segment with Devin Booker's second 3 pointer to expand their early lead to 11 points, 19-8, but Carolina outscored the Cats 6-1 to trim the lead to 6, 20-14 before Devin Booker made a pair of free throws to reestablish the 8 point lead, 22-14, at the under 12 media timeout. UNC's Meeks will have a pair of free throws after the timeout. The early pace has been about 75 possession rate for the full game. Coach Calipari returned to the starting 5, and after Meeks made both free throws, Aaron Harrison turned the ball over and UNC made the Cats pay with their first 3 pointer to trim the one time 11 point lead to only 3 points, 22-19, prompting a UK timeout with 11:25 remaining. The Cats stopped the UNC run and maintained their lead at 6 points at the under 8 media timeout with UNC in possession following the Cats' 4 th foul of the game, the second on Trey Lyles. During the last portion of the 3 rd segment, Coach Calipari inserted Tyler Ulis and Devin Booker at the guard positions with Willie Cauley-Stein, Dakari Johnson and Karl-Anthony Towns on the front line. Devin Booker became the first Cat to score into double figures on a nice give and go. In the 4 th segment, the Cats extended the lead to 9 points, 38-29, at the under 4 media timeout and with Carolina in possession of the ball following the Cats' 5 th turnover of the first half. Through the first 16 minutes, both teams are shooting at a 52% clip, UK 12-23 and UNC 13-25. The difference in the game has been at the free throw line, where the Cats have outscored the Tarheels 11-2. Aaron Harrison drained three consecutive 3 pointers in the final segment to lift the Cats to a 15 point halftime lead, 49-34.
he first half was played at a pace of 34 possessions (68 full game pace). The Cats scored its 49 points on 34 possessions (1.44 ppp) and North Carolina scored 34 points on 33 possessions (1.03 ppp). The Cats shot well in the first half making 15-26 (57.7%) overall and 6-11 (54.5%) from outside the arc. North Carolina shot well for the half, making 14-25 (56.0%) inside the arc, but the Tarheels were only 1-3 (33.3%) shooting the ball from outside the arc. From the line, UK made 13-17 (76.5%) while North Carolina made 3-4 (75.0%). UNC won the battle of the boards in the first half, out rebounding Kentucky 14-15 overall, and 7-6 on the offensive boards. Kentucky managed to edge the Tar Heels 9-8 on second chance points. The Cats managed to get only 46.2% of its misses, while North Carolina grabbed 58.3% of its misses. The Cats committed 6 turnovers (17.6%) and forced 10 North Carolina turnovers (30.3%). Carolina opens the second half, but fail to score. The Cats commit two quick turnovers, commit two quick fouls, and fail to score, allowing UNC to trim one point from the halftime lead. When UNC cannot get the ball into play from beneath its own basket, UNC takes a timeout with 18:18 remaining and the score 49-35. Over the balance of the segment, the Cats move on top by 19, 59-40 before a late 3 pointer by UNC trimmed the lead to 16 at the under 16 media timeout with the Cats in possession of the ball. In the second segment, the Cats once again moved on top by 19, but UNC scored the last 7 points of the segment to trim the lead to 12 points, 64-52 at the under 12 media timeout with 11:42 remaining, and UNC in possession of the ball with an opportunity to cut the lead to either 10 or 9 points. UNC cuts the lead to 9 on a 3pointer, their 4 th of the second half. Following a dunk on an assist by Tyler Ulis, Tyler Ulis had to leave the game due to cramps. Over the balance of the segment, the Cats ease back on top by 12, 72-60, at the under 8 media timeout with 7:09 remaining, and the Cats in possession of the ball. At the under 4 media timeout, the Cats continue to maintain their lead at 16 points, 80-64, and Andrew Harrison will be shooting free throws after the timeout. There is 3:25 remaining in the game. Cats win 84-70, and allow an opponent to score 70 points for the first time this season. UK scored its 84 points in 67 possessions (1.25 ppp) for the game, and North Carolina scored its 70 points on a total of 68 possessions (1.03 ppp). North Carolina won the battle of the boards, with a rebounding edge 31-23, and the Tarheels won the battle for the offensive rebounds 18-11. The Tarheels won the second chance points 18-14. North Carolina had an offensive efficiency of 0.765ppp on its 68 first chance possessions and 1.000 ppp for its 18 second chance possessions. UK had 1.044 ppp on its 67 first chance possessions and 1.273ppp on its 11-second chance possessions. With respect to the offensive rebounding, UK grabbed a strong 45.8% of its misses as offensive rebounds while North Carolina was able to convert 60.0% of its misses into bonus possessions with offensive rebounds. UK hit well from the free throw line in this game, making 23-31 [74.2%]. North Carolina made 10-12[83.3%] for the game. Field goal shooting for UK was 27-48 overall [56.3%] and 7-15 from long range [46.7%]. For North Carolina, their field goal shooting from inside the arc was a strong 21-47 [44.7%] and from long range, North Carolina hit 6-13 [46.2%]. The Cats committed 15 turnovers, one for every 4.5 possessions. The Cats forced 19 North Carolina turnovers, one for every 3.6 possessions. Next Game On Schedule: Saturday afternoon at 3:30 pm in Chicago against UCLA.